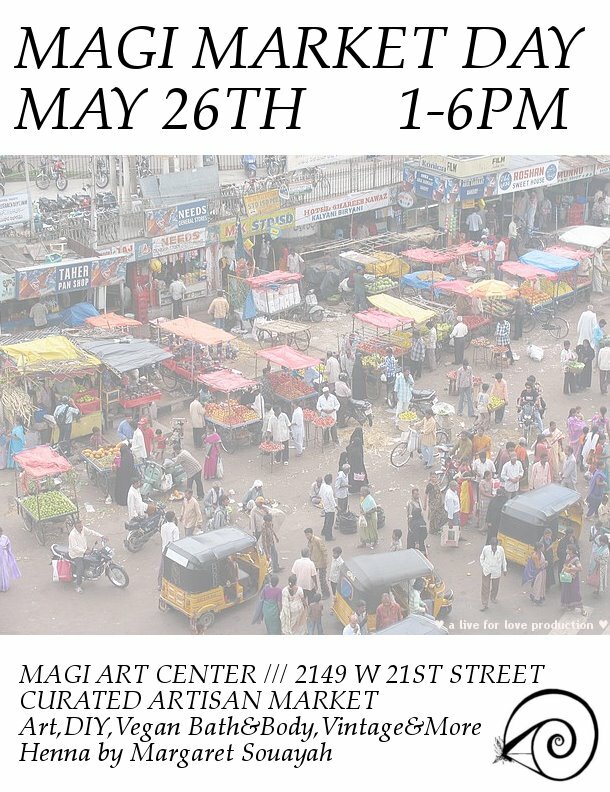 MAGI Cultural Art Center is a community-based center which was created in order to enhance the quality of life in the community it serves through art and education. concerts, theatre/dance productions, gallery exhibitions, activist benefits and Fandangos. Colibri and MAGI are partnering to create more events and classes in this New Year. 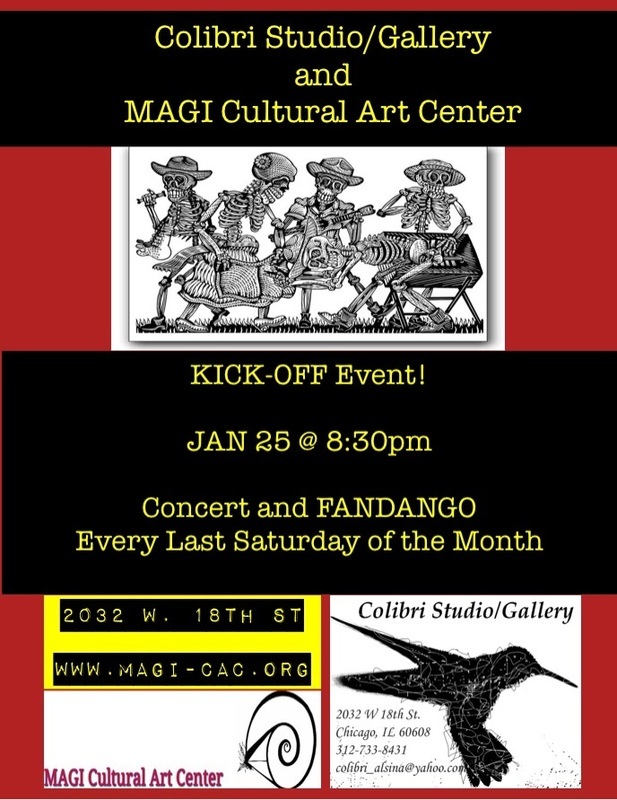 Colibri Studio & Gallery is the new 2014 residence of MAGI Cultural Art Center and we hope you can join us to celebrate our inauguration kick-off Fandango on the last Saturday of the month. Bringing back the start of a new series of concerts and fandangos EVERY LAST SATURDAY OF THE MONTH. 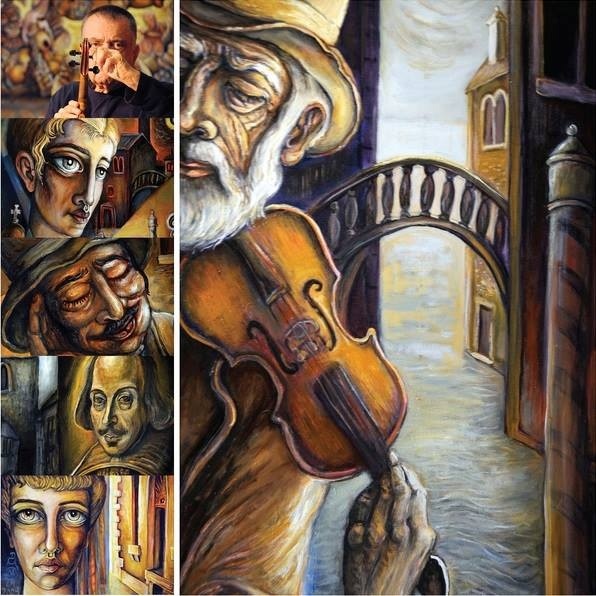 Jovan is a 78 year old Serbian painter, violinist, writer and theatre director. His visual art is themed on the idea of the Venus of Venice and painted with oil on canvas. The current collection spans the last 20 years of Jovan's life in Chicago and includes his newest work based on commemorations to Van Gogh and Renoir. Jovan also plays music from all over Eastern Europe as well as American Jazz standards. He went to school for theatre and is a seasoned theatre director as well as writer. Jovan has a collection of original manuscripts which range from plays to novels. A true Renaissance Man. $5 suggested donation for the artist and his care. The Encuentro de Jaraneros includes concerts, workshops, and fandangos which are open to the public. Open jam session at the park! Saturday July 27th 2013, 10pm - ? 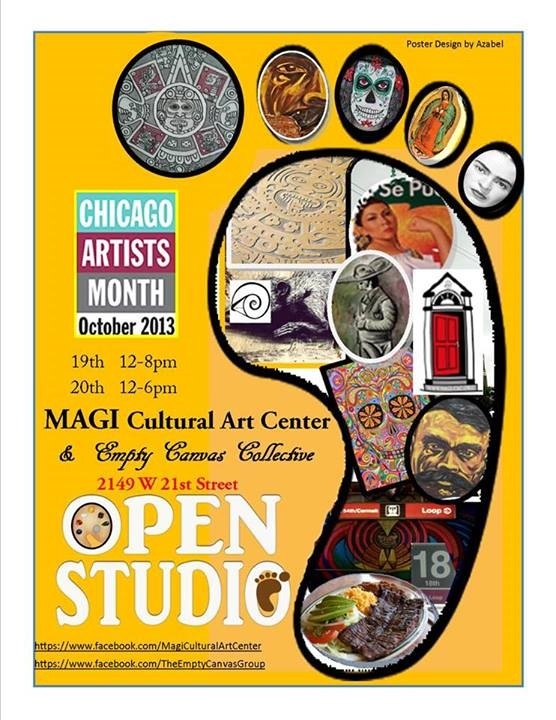 Special Thanks to the Pilsen Community, including: Eighteenth Street Development Corporation (ESDC), Old Town School of Folk Music, Rockotitlan Chicago, Pilsen Vintage, Laredo Auto Parts, La Trucha Arcoiris Restaurant, portoluz, ArteyVidaChicago MAGI Cultural Art Center, Tonantzin, Victor Navarro (artist), Meztli and the JARANEROS and SONEROS of Chicago. For current events please check our Schedule and register for workshops/classes on our Contact Page. This is an introductory but intensive "taller" (workshop) for musicians that recently started or have never played or sang the music from Sotavento (Southern Veracruz). This traditional music is played with jaranas (baroque guitars), guitarras de son (four string guitars), arpa (portable harp), zapateado (clogging on a wooden box) and versada campesina (traditional singing). Any instrumentation is welcome but traditional instruments will be provided for the students during the workshops. If you have your jarana with you, Francisco will have strings for sale and will fit your instrument with the proper gage. -Sun. June 24th 3 -6p.m. -Mon. 25th, Wed. 27th and Thurs. 28th 6 p.m. - 9 p.m. Packages and scholarships are available. Please contact Yahví, 773-844-9604 or Mercedes, 915-204-9173 for more information. All classes will end with a huapanguito (open jam). Francisco González is a musician, composer, and specialist in Mexican and Chicano music. During the last four decades he has worked in many capacities within the Chicano/Mexican music genres: in performance around the world as a string musician specializing in Mexican harp; composing music for films (most recently in All the Pretty Horses); doing lecture demonstrations; and in theater as a musical director for many professional theater productions. As award-winning musical director for the legendary El Teatro Campesino he toured throughout Western Europe. González grew up in East Los Angeles surrounded by jazz, rock, salsa, and multiple Mexican musical traditions such as norteño, and jarocho music. He co-founded, led, and composed music for Los Lobos in the 1970s. Thereafter he became a solo performer and musical director for stage performances. Francisco González work in musical direction and performance has gained widespread recognition. For outstanding musical direction and arrangements he was awarded the San Francisco Chronicle’s Circle Award “for outstanding achievement in the theater”. In the last ten years, González has also written and performed music for various films. In addition to theater and film work, González regularly performs Jarocho and Norteño music at clubs, fiestas, and other social gatherings. He also offers workshops for musicians, and lecture demonstrations on Mexican/Chicano music at universities, schools, and for community groups. In June 2004 Francisco González received national recognition from the Smithsonian. He was invited to the American Folklife Festival for his many contributions to the musical life of the Chicano/a & Mexican communities. The Smithsonian highlighted Francisco’s contributions as a music string craftsman. His custom-made strings produced at Guadalupe Custom Strings in Santa Barbara, California were distributed internationally. In January 2011, González was honored by the Santa Barbara Trust for Historic Preservation and was given the Pearl Chase Award for Historic Preservation and Conservation, that organization’s highest and nationally recognized award. González’s most recent recording The Gift / El Regalo combines a repertoire from the Mexican oral tradition with many of his own compositions. 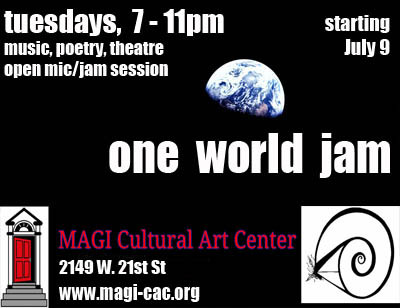 CHICAGO, IL – June 19, 2012– Arriving from Mexico, JORGE H. DE HARO makes a 1-week stop in Pilsen to lead a 5-day theater workshop (taller de teatro) from 6/25-6/29 at the MAGI Cultural Center and punctuates his visit with an impressive interpretation of SOLO by Samuel Beckett. SOLO, performed and directed by Haro, will appear at Calles y Suenos on June 29th, as well as, MAGI Cultural Center on June 30th. Start time is 8:00pm at both functions. Catch Beckett's monologue as interpreted by a contemporary and impressive Mexican actor. Monologue performed in Spanish. About SOLO | A man of 83 years, lives his past and present through a series of repeat arguments about his past life and what happens in that moment in the midst of an overwhelming loneliness that both nurtures and annihilates during a dark night that seems eternal. The permanent and the transient appear to melt into the repetitive ideas that incessantly float around the faint light of an oil lamp. Jorge H. de Haro Duarte | Since 1968, in various periods, he has dedicated himself to theatrical activities and participated in at least twenty distinct works as an actor, director, and dramaturge. His dedication to theatre has taken him to Jalapa Veracruz, Zacatecas Zac., Kalamazoo, Michigan, and Salamanca y Dolores Hidalgo, Guanajuato. Samuel Beckett | An Irish poet and dramatist. He studied at Trinity College in Dublin where he met his lifetime friend James Joyce. After World War II, he produced his most famous works, including the absurdist play Waiting for Godot. He aimed to illuminate the essential aspects of our existence by putting his subjects in absurd situations. He won the Nobel Prize for Literature in 1969. Box Office: Opens 30 minutes prior to start time. Colectivo El Pozo -Founded in 2009 by Raúl Dorantes, Marcopolo Soto, Ignacio Guevara, Febronio Zatarain y other Latin American writers now residing in Chicago. Colectivo El Pozo has since served as Chicago’s only Spanish-language theatre ensemble dedicated to creating original work that explores the diverse realities of Pan-Latina/o immigrants in the city of Chicago. Since its inception, Colectivo has attempted to expand theatrical opportunities for Chicago artists that are mutually interested in developing Spanish-language theatre works and also interested in the range of themes within the broader scope of Immigration. The ensemble ranges from seasoned to emerging actors and participants. We are aware of this limitation. Regardless, we feel it necessary to tackle this impactful artistic genre, that is Theatre, and create a space where the immigrant voice and narrative is regularly staged in Chicago. Colectivo El Pozo currently tours colleges/universities, festivals and venues across the city and is preparing to tour nationally. In addition to producing at least 2 new works per season, Colectivo El Pozo stages dramatized readings throughout the year.